Birth date and place 14 May 1820 Latten, Tippperary, Ireland. Physical Description Height: 5 ft. 9½ ins. Complexion: fresh. Eyes: blue. Hair: light brown. 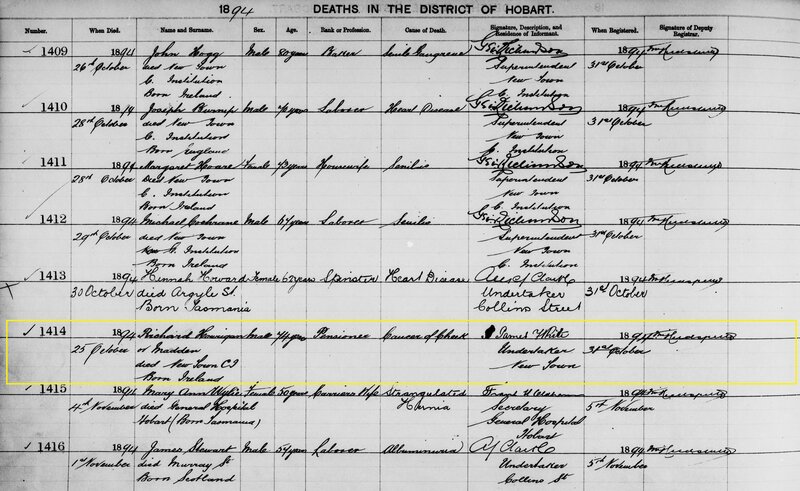 Death date and place 25 Oct 1894 New Town, Hobart, Tasmania (tentative). 19th Regiment found at Victoria Station 1876-1879 [WO22-300 p.117]. 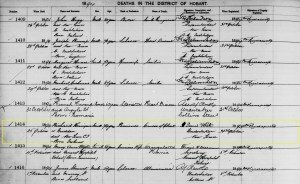 Burial date and place 27 October 1894 Hobart Public Cemetery, Tasmania (tentative). See Note above. 4th (Queens Own) Light Dragoons Regiment. Regiment No. and Rank #528 Private. Attestation date and place 14 Oct 1836 Limerick, Limerick. 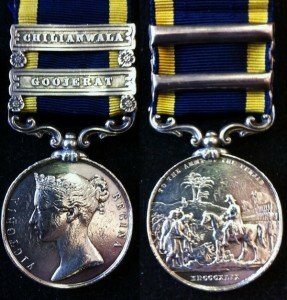 Service/Campaigns East Indies 13 years 6 months. Army in East, Turkey & Crimea 10 months. Landed in Crimea 1 Jun 1855 [WO100-24-209]. Musters 1841 Karnaul, Bengal [WO12-589]. Promotions Private to Corporal 22 Dec 1845. Corporal to Sergeant 1 Feb 1848. 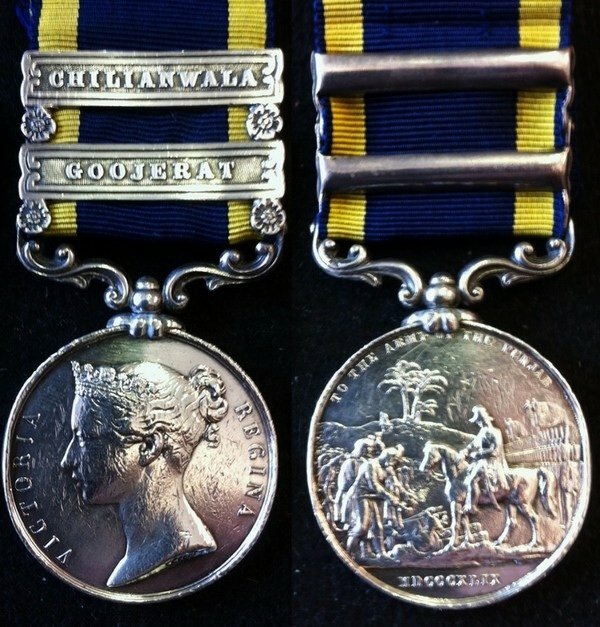 Medals, Clasps and Badges Sutlej Medal Moodkee (exergue) clasps Ferozeshuhur & Sobraon. 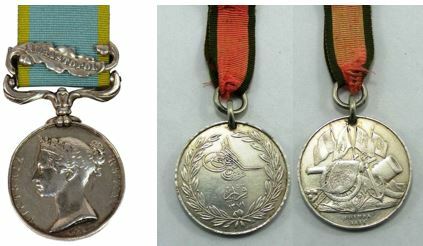 Punjab Medal clasps Goojerat & Chilianwala. 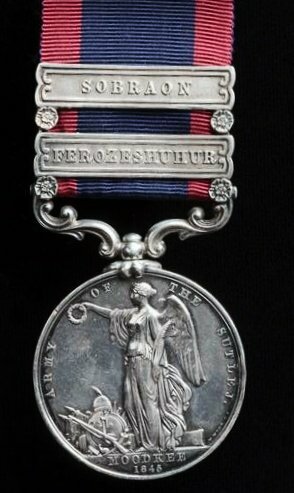 Crimea War Medal clasp Sebastopol. Turkish Crimea Medal. 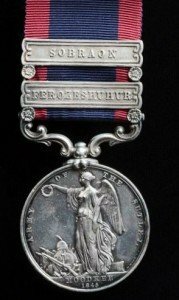 Regimental Courts Martial 11 Feb 1858 and sentenced to be reduced from sergeant to the rank and pay of a private dragoon. Sentence remitted. Discharge date and place 10 Jun 1862 Cahir. Length of Service 24 years 28 days. Post Discharge Residence Wood House Farm, Cahirconlish, Limerick. Post Discharge Pension District Limerick. Pension Amount 2/- per diem. Increased to 2/2½d. per diem 18 Jan 1881 for service EPF. Left Limerick, Ireland 1867 for Adelaide, SA. Jan 1874 arrived in Perth, WA. Departure and Arrival Arr. March 1864 (tentative). Misc. Newspaper Articles Fremantle Herald 15 Jan 1881. Adelaide Evening Journal 21 Sep 1881. South Australian Police Gazette 28 Sep 1881. Departure from WA Rob Roy dep. 11 Jan 1881 Fremantle for Adelaide. A Richard Hourigan’s Death Certificate, Hobart (ref RGD35/1/14/1414]. See Note re indistinguishable records.